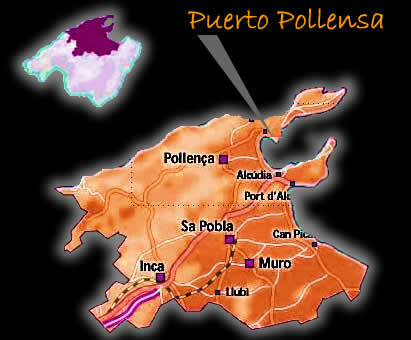 Pollensa properties tend to command a higher price than the Port of Alcudia. The area is highly sought-after and as such any purchase in the area is an excellent investment prospect. However Alcudia is stones throw from the Port of Pollensa and properties there tend to offer many of the advantages which make Pollensa so popular, while at the same time representing excellent value for money. For the budget of a townhouse in Pollensa, it is often possible to acquire an independent property with the advantages of fabulous views, proximity to the beach and the countryside. In short, the area of countryside between the Port of Pollenca and the Port of Alcudia is worth keeping an eye on, because some surprising opportunities arise there from time to time. We have also a great selection of luxury country homes in the Pollensa area for sale. Puerto Pollensa : A few kilometres from the old city centre is Puerto Pollensa, this part of the town is known for its beautiful beaches. This part of town can not be compared with the old city centre. There are several big and small beaches in the area of Puerto Pollensa. The Pollensa area also has a blue flag beach, Cala Formentor, this means that Puerto Pollensa has a beach that meets up to a high level of standard. The backdrop of pine trees, fine sandy beaches and warm crystal blue waters attract many people from around the area. It is very easy to get from Puerto Pollensa to this beach, if you take the road out of Puerto Pollensa to the north east part of the island. Cala San Vicente is one of the smaller, but also one of the most beautiful beaches in the area. Alcudia and Port de Alcudia: The beach at Alcudia is 6 miles long and stretches as far as C'an Picafort. Alcudia joins with Playa de Muro which is home to S'Albufera; a natural park that is under protection and is very habitual to admire a very diverse fauna. From the Port D'Alcudia you can take boat trips around parts of the island and also get a ferry to Menorca and Barcelona with daily services. Alcudia is known for its long golden beach that slowly flows into the sea. Besides this the sea can also be enjoyed in a more active way, Alcudia offers great facilities for almost all sorts of water sports. Or you could just take stroll on the beach or walk past the marina. If you want something other than the water, Alcudia also offers great other sports facilities like tennis courts, horse riding and much more. The surroundings of Alcudia are some of the best, for example next to the town is the national park La Albufera. Every year many birds come up here to nest. Also there are many walking/hiking possibilities and the Virgen Caves, with beautiful beaches. In the evening it does not turn into a loud resort, there are some bars and nightclubs, but it is not a very active scene.